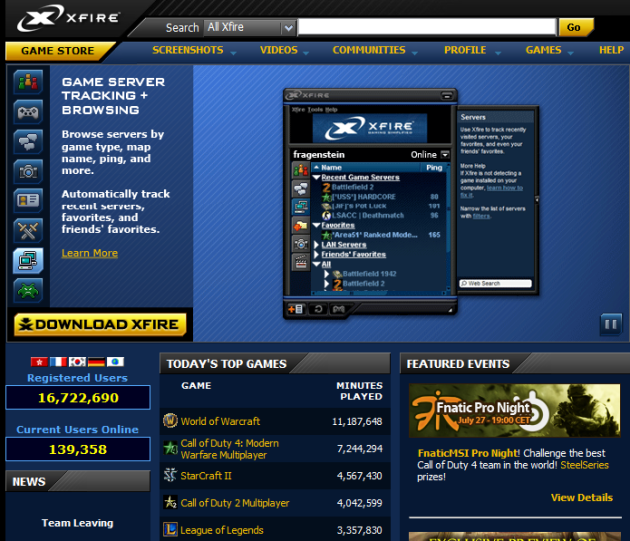 Xfire, the social network for gamers that was acquired by Viacom for $102 million back in 2006, has a new owner. The buyer is Titan Gaming, a small company that raised a mere $1 million in angel funding to date, so we’re making an educated guess here and going to assume that it was sold for a song compared to the price Viacom paid a couple of years ago. August 2, 2010–Xfire has been purchased by another company. Most of the team that has brought you Xfire for the last 6 years is leaving, including me. We’ve enjoyed our time and I personally am sad that I was only able to do 127 releases. Good bye and game on! The message comes from someone named ‘Chris’ – most probably Chris Kirmse, Xfire founder and VP of Engineering. Krimse was once Senior Engineer of Yahoo Games – said to have built the Yahoo FIFA system – before creating Xfire back in 2003. Xfire is a free service that enables gamers to interact with each other coupled with a tool that automatically keeps track of when and where gamers are playing PC games online. It works regardless of game type, server browser, or gaming service. The service thus eliminates the need to run multiple programs like IRC, instant messengers, or in-game friends lists to keep track of when and where a gamer’s friends are playing. It combines instant messaging, a server browser, peer-to-peer file downloads, in-game messaging, screenshot and video capture and an active gaming community. The service has attracted some 16 million users to date. Titan Gaming has purchased Xfire. The terms of the purchase are undisclosed. Titan will be taking on the Xfire name. The Xfire services will continue uninterrupted for its users. Xfire redefined how gamers communicate, Titan intends to build upon this tradition and utilize the Xfire platform to help gaming companies better engage and monetize their games. Maffei adds that Titan Gaming has retained several key members of the development staff, which sounds far more positive than the statement on Xfire’s website – which reads that most of the team is leaving the company – suggests. Titan Gaming last May announced that it had raised $1 million in funding from a slew of prominent angel investors. You can find the full list of investors on the startup’s CrunchBase profile, but it includes people like Clearstone Venture Partners principals William Quigley and Jim Armstrong, PriceGrabber co-founder Kamran Pourzanjani and MP3.com founder Michael Robertson.